For many years now I have been using the excellent XAMPP development environment from Apache Friends on my Windows machines. This is how I migrate from one version of XAMPP to another. I am primarily using this for WordPress website development, so I am only concerned about the MySQL and Apache Server configuration – your situation may be different and require additional processes. My XAMPP is installed into C:\Apps\xampp\ – adjust for your own environment. C:\Apps\xampp\mysql\bin\mysqldump --user=root --all-databases >"D:\My Backups\all_databases.sql"
Stop all modules in the XAMPP Control Panel and Quit. I backup my XAMPP environment with the following script – not all of these files may be present in your environment. "C:\Program Files\7-zip\7z.exe" a -tZip -spf -y "D:\My Backups\XAMPP.zip" "C:\apps\xampp\apache\conf\create_certs.cmd"
"C:\Program Files\7-zip\7z.exe" a -tZip -spf -y "D:\My Backups\XAMPP.zip" "C:\apps\xampp\apache\conf\.rnd"
"C:\Program Files\7-zip\7z.exe" a -tZip -spf -y "D:\My Backups\XAMPP.zip" "C:\apps\xampp\apache\conf\ssl.crt\"
"C:\Program Files\7-zip\7z.exe" a -tZip -spf -y "D:\My Backups\XAMPP.zip" "C:\apps\xampp\apache\conf\ssl.key\"
"C:\Program Files\7-zip\7z.exe" a -tZip -spf -y "D:\My Backups\XAMPP.zip" "C:\apps\xampp\apache\conf\extra\httpd-vhosts.conf"
"C:\Program Files\7-zip\7z.exe" a -tZip -spf -y "D:\My Backups\XAMPP.zip" "C:\Apps\xampp\mysql\bin\my.ini"
"C:\Program Files\7-zip\7z.exe" a -tZip -spf -y "D:\My Backups\XAMPP.zip" "C:\apps\xampp\php\php.ini"
"C:\Program Files\7-zip\7z.exe" a -tZip -spf -y "D:\My Backups\XAMPP.zip" "C:\Apps\xampp\php\ext\php_xdebug-*"
"C:\Program Files\7-zip\7z.exe" a -tZip -spf -y "D:\My Backups\XAMPP.zip" "C:\windows\system32\drivers\etc\hosts"
Get the version of XAMPP to be installed from the Apache Friends site. Once installed (and before starting any modules), copy the configuration. The PHP configuration (php.ini) requires some manual updating. Edit C:\apps\xampp\php\php.ini to include your custom settings – I include these at the end of the file, making it easy to copy from the old configuration. 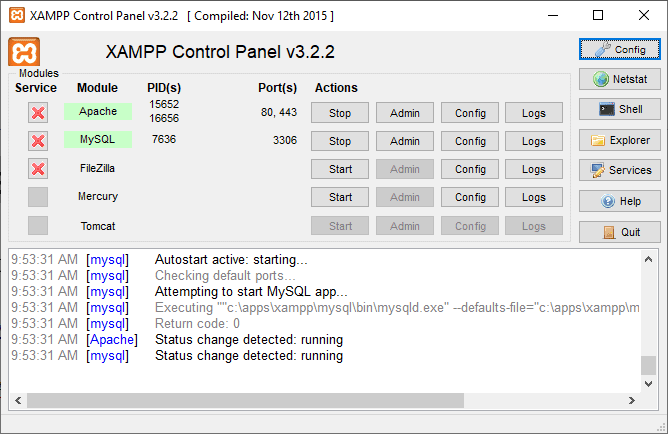 Open the XAMPP Control Panel and start the Apache and MySQL modules. Browse to a XAMPP hosted website and confirm correct operation.